Cisco introduced a multilayer storage director boasting 24 terabits per second of total switching capacity, almost three times the bandwidth of any director in the industry, along with a new fabric switch. The products are aimed at serving massive amounts of data, solid state drives (SSD) and cloud-based environments. 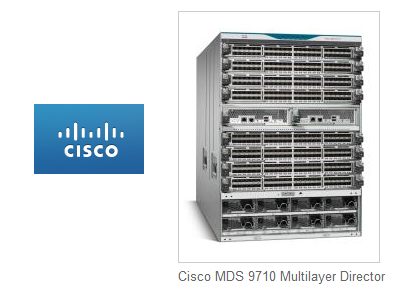 The new Cisco MDS 9710 Multilayer Director supports both high-density Fibre Channel and Fibre Channel over Ethernet, enabling consistent SAN and LAN networking operations. It builds on the company's MDS heritage of nonstop operations, including software upgrades, by providing the highest fault-tolerant capabilities with fully redundant (N+1) fans, switching fabrics, and power-supplies or grid redundancy (N:N). It accepts new 48-port 16 GB Fibre Channel and 48-port 10 GB FCoE line cards, enabling the platform to scale up to 384 line-rate 16 GB Fibre Channel ports or FCoE in a single 14 RU chassis. The Cisco MDS 9250i Multiservice Fabric Switch delivers storage services, including Cisco I/O accelerator and Data Mobility Manager, which improve SAN efficiency by performing important storage services centrally in the fabric. It offers up to 40 line-rate ports of 16GB FC/FICON, 8 ports of 10 GE FCoE, and 2 ports of 1/10GE FCIP/iSCSI, while delivering a rich set of storage services via licensing. A SAN Extension capability enables backup, remote replication, and other disaster-recovery services over WAN distances using open-standards FCIP tunneling. In addition, a Cisco I/O Accelerator (IOA) provides acceleration for MAN/WAN applications, and wire encryption for backup and replication operations, making disaster recovery and regulatory compliance easier. 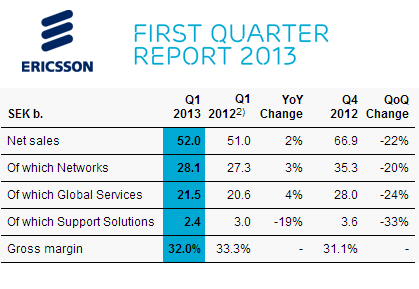 Ericsson reported Q1 2013 net sales of SEK 52.0 billion (US$7.84 billion), down 22% compared to Q4 2012 but up 2% compared to Q1 2012. Operating income, including joint ventures, was SEK 2.1 billion, with an operating margin of 4.0%. "Sales showed positive development in the quarter with a growth of 2% YoY, despite currency headwind. Sales for comparable units, adjusted for FX and hedging, grew 7%," said Hans Vestberg, President and CEO of Ericsson. "The sales increase was primarily driven by Networks and rollout services, following high project activities primarily in Europe and North America. North America remained the strongest region and showed a growth of 23% despite the decline in CDMA. North East Asia had a challenging quarter with lower sales in South Korea, which remains one of the most advanced LTE markets but without parallel 3G deployments as in Q112, continued structural decline in GSM investments in China and FX effects in Japan," added Vestberg. Networks sales increased 3% YoY, primarily driven by North America and South East Asia. Networks sales decreased -20% QoQ, partly due to lower sales in North East Asia, offset by continued high business activity in North America. Global Services grew 4% YoY, driven by Network Rollout and decreased -24% QoQ, partly due to lower business activity in North East Asia and delays in LTE deployments in Latin America. Support Solutions sales declined -19% YoY and -33% QoQ, mainly due to the divestment of Multimedia Brokering (IPX) in Q312 and negative FX effects. Restructuring charges for the Group amounted to SEK 1.8 (0.6) b., of which SEK 1.4 b. related to the significant reduction of operations in Sweden. "This is a transformative year for Sprint and we’ve gotten off to a good start,” said Dan Hesse, Sprint CEO. "Record Sprint platform service revenue and subscriber levels fueled our performance. We achieved significant Adjusted OIBDA growth while investing heavily to improve our network, expanding our 4G LTE footprint and offering customers the best smartphones with truly unlimited data plans." The company's Network Vision deployment is on track. To date, there are more than 13,500 sites on air compared to more than 8,000 reported on Feb. 7. The number of sites that are either ready for construction, already underway or completed has grown to more than 25,000. Sprint's LTE network is now operational in 88 cities, including newly launched Los Angeles, Boston and Charlotte, N.C.. The company expects that 4G LTE will be available in more than 170 additional cities in the coming months. At the end of Q1, there were 53,896,000 subscribers on the Sprint platform, up by 356,00 for the quarter. At the end of Q1, there were 1,315,000 subscribers left on the Nextel network. 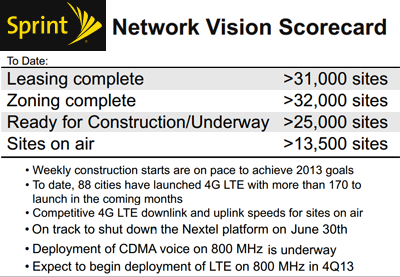 Sprint captured about 46% of exiting Nextel customers in Q1. The Nextel network will be deactivated on June 30. 86% of quarterly Sprint platform postpaid handset sales were smartphones, including more than 1.5 million iPhones sold during the quarter. Forty-three percent of iPhone sales were to new customers. Postpaid ARPU on the Sprint platform was $63.67 for Q1. Gigamon outlined its vision for software-defined monitoring based on a four-layer architecture: a Services Layer, a Management Layer, an Orchestration Layer and an Applications Layer. "As data networks evolve from physical to virtual to software-defined networks (SDN), the role of network visibility needs to evolve as well," said Shehzad Merchant, Chief Strategy Officer at Gigamon. 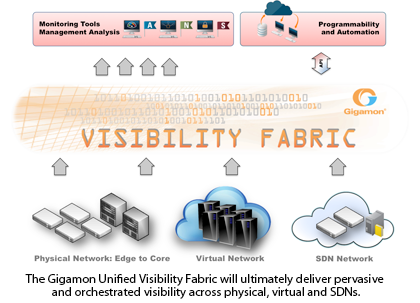 "The Gigamon Unified Visibility Fabric architecture has advanced the vision from providing intelligent traffic filtering and aggregation, to a centralized, policy driven fabric that serves multiple constituents, departments and tools, each with their own policy model. Going forward, we expect that the Unified Visibility Fabric architecture would enable customers to implement 'Visibility as a Service'. And, as Gigamon continues to develop its offerings, our vision is that this ability will not just be for the physical network, but also across virtual and SDN 'islands' as well." EarthLink announced the opening of a new data center in Dallas. EarthLink said it is also preparing to open three additional data centers in Chicago, San Jose and Miami in the coming months. These four new data centers, in addition to the existing center in Pittsford, NY, provide the company with a total of five data centers on its next generation cloud hosting platform. EarthLink also operates data centers in Atlanta, Columbia, SC and Marlborough, MA., all linked to its nationwide IP network. Hutchison Global Communications Limited (HGC) awarded a 3-year contract to Transmode to supply a ROADM-based 100G optical backbone network for a new high capacity network in Hong Kong. 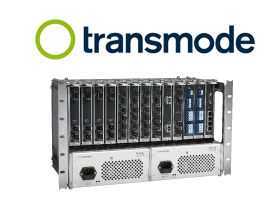 Under the frame agreement, HGC will deploy Transmode’s TM-Series including Gigabit Ethernet, 2.5G, 10G, 40G and 100G transport over an 80-wavelength ROADM-based Flexible Optical Network with Transmode’s Enlighten multi-layer management suite. The first deliveries for the project have already started and initial services are planned to be operational in H1, 2013. The new network, which will cover the entire region, including Hong Kong, Kowloon and New Territories, will initially serve corporate and wholesale customers by interconnecting a large number of customer premises, data centres and submarine cable landing stations. Qualcomm reported Q1 revenue of $6.12 billion, up 24 percent year-over-year and 2 percent sequentially. Net income was $1.87 billion, down 16 percent YoY and 2 percent sequentially. Diluted earnings per share were $1.06, down 17 percent YoY and 3 percent sequentially. During the quarter, MSM chip shipments reached 173 million units, up 14 percent YoY and down 5 percent sequentially. 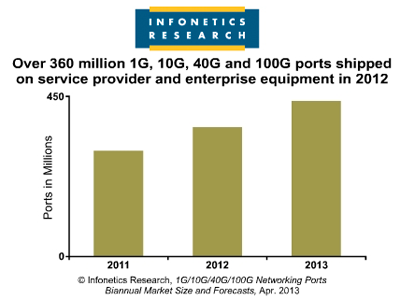 The number of 1G, 10G, 40G, and 100G network ports shipped on service provider and enterprise equipment in 2012 grew 22% over the previous year, to top 360 million, according to a new report from Infonetics. “Revenue per port is plunging — up to 30%+ per year for new categories like 40G and 100G — and this will help drive adoption of higher speed ports. In the optical segment, I expect 100G to account for more than 10% of optical transport spending in 2013," added Andrew Schmitt, principal analyst for optical at Infonetics and co-author of the report. ADVA Optical Networking reported Q1 2013 revenue of EUR 77.0 million in Q1 2013, down 5.7% vs. Q1 2012 at EUR 81.7 million and down 4.0% vs. EUR 80.3 million in Q4 2012. IFRS operating income amounted to EUR 0.4 million in Q1 2013, after EUR 3.5 million in Q1 2012. “While the temporary decline of our business related to short-term market weakness driven by adverse macro-economic conditions and temporary shifts in carrier investment priorities clearly is a disappointment, we are still pleased to report our Q1 2013 revenues of EUR 77.0 million at the upper end of guidance. Our pro forma gross margin decreased from 41.8% in Q4 2012 to 38.6% in Q1 2013, due to quarterly variations in product and customer mix. In Q1 2013, our pro forma operating margin came in at 1.0% in the upper half of guidance, demonstrating our focus on managing operational costs in this challenging environment. Also, operating cash flow at EUR 1.7 million in Q1 2013 remained positive, and our quarter-end cash & cash equivalents and net liquidity of EUR 65.3 million and EUR 36.3 million, respectively, demonstrate ongoing financial strength,” commented Jaswir Singh, chief financial officer & chief operating officer of ADVA Optical Networking.